A single serving cake that is less than 320 calories and packed full of protein for a healthy and super satisfying dessert! Have you ever wanted to sit down and eat an entire cake all to yourself with no guilt??? Oh...ok just me? Hah. Nah, I don't need a whole regular size cake to myself, that may be a bit excessive. But a single serving cake that is still a large serving size that not only tastes great but is packed full of protein??? Yup, SIGN ME UP FOR THAT ONE. 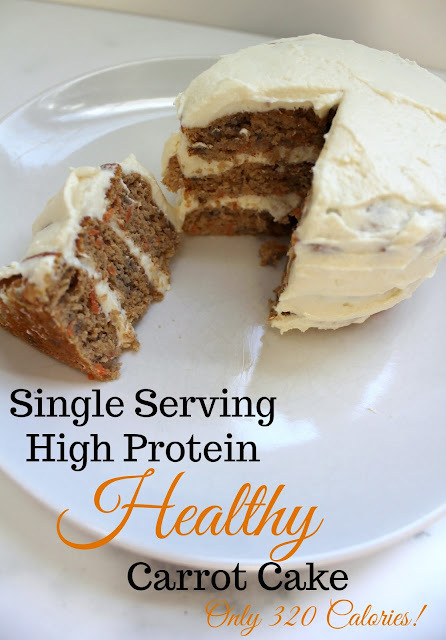 You can use the basics of this recipe to create various other flavor cakes but I made this version of high protein cake into a healthy carrot cake! 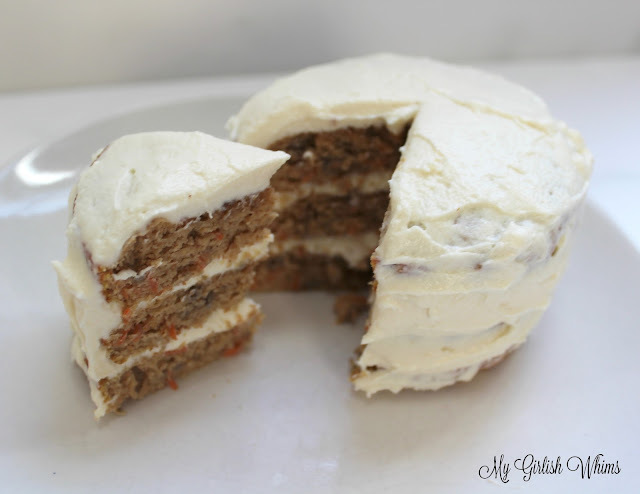 Carrot cake is one of my favorite desserts ever (as long as it doesn't have raisins in it. SERIOUSLY. Who would ruin an amazing carrot cake by stuffing shriveled up grapes in it???) and with Easter right around the corner I figured a healthy and high protein carrot cake recipe would definitely be appreciated. Most years at Easter I give myself free reign to enjoy all the yummy treats at brunch with my family, but this year Easter falls on the Sunday right before I leave for vacation in JAMAICA (!!!) so I want to keep a little better track of what I'm eating since only four days after the holiday I'll be lounging in a bikini in Jamaica soaking up the sun :) I'm definitely thinking that this little mini cake will be the perfect Easter treat for me: who has to feel deprived when you can eat a whole cake for less than 320 calories which INCLUDES the cream cheese frosting! You will need mini cake pans to make this cake: for size reference I used pans that were 4 inches in diameter which I bought off amazon for less than $7 for a set of three (affiliate link). Since this is a mini cake it only takes 10 minutes to bake so it can easily be whipped up when the craving for cake strikes! 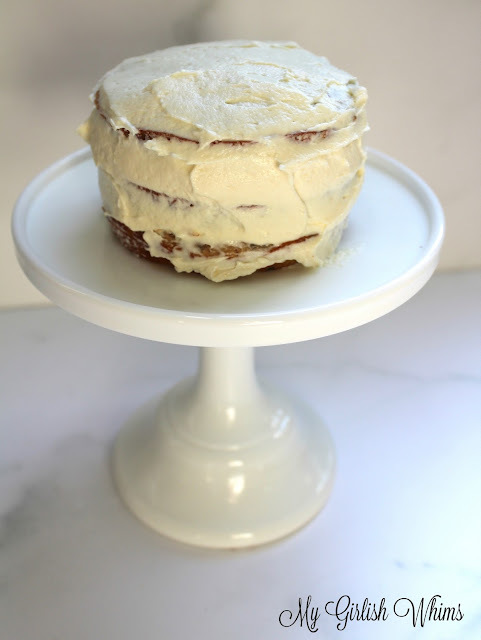 Each of the three mini cakes gets layered with a healthy cream cheese frosting so each slice is full of both delicious cake and the sweet creamy frosting for a totally epic dessert. Last but not least: if you are following a high protein diet this cake with the frosting packs a heaping 39 grams of protein in it! Have I convinced you yet that you NEED to try this??? I think I've convinced myself that I need to make this again even before Easter ;) YUM!!! The cake alone comes out to 184 calories with 15 grams of carbs, 2 grams of fat and 26 grams of protein. The frosting is an additional 134 calories with 11 grams of carbs, 4 grams of fat and 13 grams of protein. Total for the whole cake frosted is 318 calories with 26 grams of carbs, 6 grams of fat, and 39 grams of protein. Preheat oven to 400 degreesCombine all dry ingredients from protein powder through nutmeg In a separate bowl combine wet ingredients, apple sauce through vanilla Fold wet ingredients into dry ingredient and stir until combined Pour cake batter into three mini cake pans Bake at 400 degrees for about 10 minutes and then let coolWhile cake cools, combine all frosting ingredients in a bowl and then whip together with a fork.Remove cakes from the pans after they are cool and spread a layer of frosting on one mini cake Top with another cake and then add another layer of frosting and top with the last cake. Frost all around the sides and top of the cake then serve! This looks really fresh and comforting! I can't wait to try it as the weather starts cooling down! I literally put out almost the exact same recipe in my newsletter 2 weeks ago. 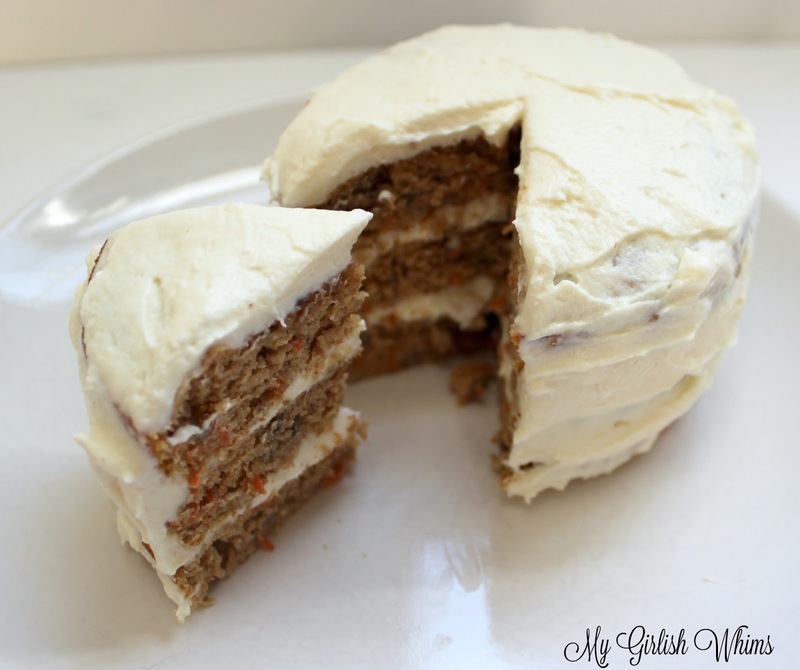 popular time of year for carrot cake! hope yours was yummy too!